For more info about the nutrition program, check the frequently asked questions below or contact me here. What is the ProCoach Program all about? ProCoach, powered by Precision Nutrition, is a research proven 12-month body transformation program that will help you transform your body and health in an amazing way. If you’ve tried different diets in the past and have failed, or simply can’t stick to them, know that you are not alone. These are good while they last, but when you go back to your old habits it’s back to square one. This program will help get you off the dieting rollercoaster by guiding you through important nutritional foundations and helping you create healthy eating and lifestyle habits that will last forever. We will help you bring health and fitness into your life in a way that works for your life and your body. This program is designed to work on your absolute worst days, not just your best days. Together we will make fitness and nutrition a part of your busy life, not having it take over your life. If you want to get healthier, fitter, and stronger—and stay that way for the rest of your life, this program is for you. It is designed for people with busy schedules. I will work closely with you to help you consistently eat well and exercise, no matter what other craziness is going on in your life. I provide you with the personal accountability you may currently be missing, a structured nutritional program to follow, and will help you stay consistent and on track. You won’t be getting any crazy diet to follow. Instead, my main focus will be to help you build healthy habits that will get you results that last a lifetime. This program is not for people who already have all the accountability they need. If you are someone who rarely struggles with staying consistent with your exercise or eating habits, this program is not a good choice for you. If you follow my recommendations and stick with me for the full year then yes, you will get results. But you have to commit to making small strategic changes in your life. That’s something no one ever likes to admit about getting in better shape: it takes hard work, time, and determination. Changing your body isn’t easy, but it IS possible. For 15 years Precision Nutrition has helped thousands of people do all that and more. No other company has this track record, and I’m so excited to be powered by PN so that I can offer the ProCoach curriculum to you. I am 100% confident that I can help you get the results you want. Once you make the commitment to get in better shape, I’ll be with you every step of the way. When life pushes you around and difficulties come up, I’ll help you push back. Over the course of 12 months, you’ll learn everything you need to look, feel, and perform at your best. If you stick with me for a year, follow my recommendations and don’t get what you are looking for at the end of the 12 months, I will refund every penny. No questions asked. It’s the right thing to do. You must complete at least 80% of the program, showing you have taken action in following my recommendations. If you do so and are not happy with your results, I’ll give your money back. Why? I stand by my coaching and I know after spending 12 months together you’ll walk out healthier and happier than every before. Meal plans and diets are not really that effective or sustainable for most people. People often feel like their either “on” them or “off” them. If they’re not eating perfectly at every meal they feel like they’ve failed and are hopeless. The Precision Nutrition approach is completely different. We help you build a set of sustainable habits that will serve you for the rest of your life. This means I will guide you and help you choose which foods are best for you, when to eat those foods, and how much to eat of them. I find this approach to be much more realistic and successful with most people. Yes! I absolutely LOVE working with people who are new to exercise and healthy eating. I think we sometimes forget that we were all beginners at some point and I will do my best to make sure we work together at a pace that is comfortable for YOU. My clients come in all different body types, ages, and backgrounds. I'm NOT a beginner. Will this program work for me? Many of my clients have years of experience with exercise and healthy eating and still get great results, if not better results, with me. This is no a cookie cutter “one size fits all” program. This coaching program is tailored to you and your specific needs. I often find (and I’ve done this myself before), people with years of experience enjoy working with a coach because they don’t have to spend time thinking about these things. I will take care of the nutrition and exercise programming for you so that you can focus more on improving other areas of your life. What if I don't have much weight to lose, but just want to eat better? Absolutely! Longterm health and fitness is about so much more than just losing weight. This program will teach you how to maintain a healthy body for life! You’ll discover how it feels to be more physically capable, more confident, and stronger—both inside, and out. You’ll also develop a new, healthier relationship with food and eating. And fun fact: that’s something fewer than 5 percent of people know how to do! Do I have to submit progress pictures? While I will encourage you to take progress pictures, you absolutely do not have to submit them if it’s not something you feel comfortable doing. These are completely optional. 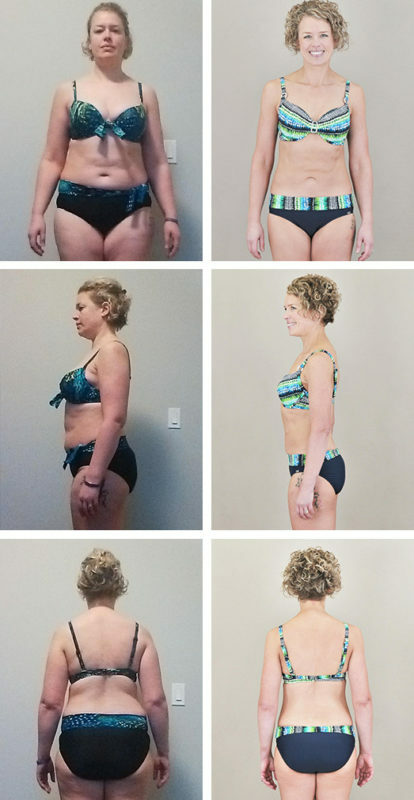 The reason I do, and will, encourage you to take progress pictures is so that you can visually document and SEE the changes you are making throughout our time working together. The scale does not often reflect what is really going on with your body, like pictures can. Progress pictures also help me, as your coach, see what’s really happening so that I can give you better advice when needed and make sure your journey is the most successful it can be. If you do choose to upload your photos, be assured they will be kept private at all times. I will never share anything without first asking your permission to do so. Remember, I am here to help YOU change your body and your life for the long term. I am not here to embarrass you or make you feel ashamed. You can absolutely choose to opt out of the photo process if you wish. However, I will encourage you to step a little out of your comfort zone and give this measurement method a try. It depends what coaching option you feel would be best option for you. View the coaching package options here. Will I need to spend a lot of money on food and supplements? This is not a program related to any network marketing company so you will not be required to spend money on supplements monthly. I may recommend a few supplement products, based on your specific needs and goals, but these will be completely optional for you. As far as food, most of my clients actually end up SAVING money on their grocery bills because they make more informed decisions, eat out less, and spend their money on nutritious and delicious natural foods rather than wasting money on more expensive processed foods. I live in (insert your country). Can you still work with me? Absolutely! I work with clients worldwide. No matter where you live, I can help! Of course! I’d love to work with you. I follow a mostly plant-based/vegan diet myself. The nutrition habits I will coach you through are easily customizable to YOUR specific needs. I'm ready to get started. Sign Me up!